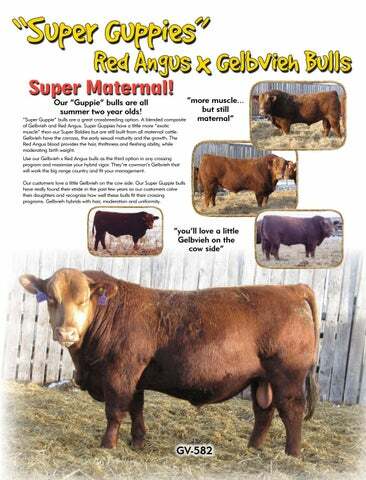 “more muscle... but still maternal” “Super Guppie” bulls are a great crossbreeding option. A blended composite Our “Guppie” bulls are all summer two year olds! of Gelbvieh and Red Angus. Super Guppies have a little more “exotic muscle” than our Super Baldies but are still built from all maternal cattle. Gelbvieh have the carcass, the early sexual maturity and the growth. The Red Angus blood provides the hair, thriftiness and fleshing ability, while moderating birth weight. Use our Gelbvieh x Red Angus bulls as the third option in any crossing program and maximize your hybrid vigor. They’re cowman’s Gelbvieh that will work the big range country and fit your management. Our customers love a little Gelbvieh on the cow side. Our Super Guppie bulls have really found their stride in the past few years as our customers calve their daughters and recognize how well these bulls fit their crossing programs. Gelbvieh hybrids with hair, moderation and uniformity.